Knowing and understanding your audience is crucial to your business success. In a recent article I discussed how to idolize your perfect/client/customer/partner and then demonstrate unique value to them. But what about right now? Who is your business currently reaching? What do they look like? Is this the person you were imagining? I am going to walk you through some basics behind Google Analytics that will help you understand your current reach and audience. If you are not already utilizing the free analytics service from Google, I highly suggest adding the code to your website (or asking your web developer to). In Squarespace adding this feature is very simple, here are some instructions. 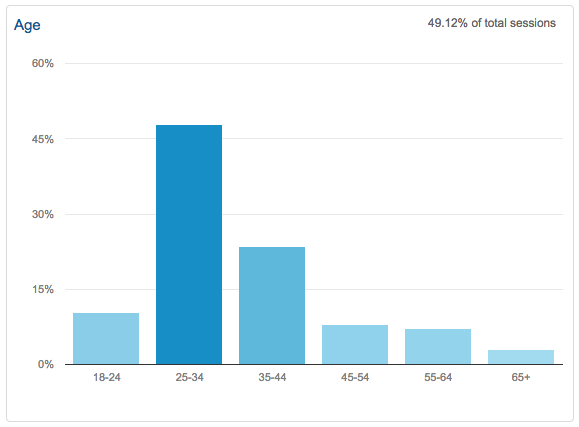 This view gives you a basic snapshot of the age and gender of your web traffic. You will quickly notice my largest categories are women age 25-34. If you want to get into more specifics you can look at day, week and month views with the Demographics > Age tab. This will help you visualize what content is resonating with which age group. You will notice my content is read by someone age 25-34 nearly 50% of the time. However, a big differentiator is the 35-44 age group, though there are fewer of them they spend an average of 4mins 10secs a session compared to the younger categories, which are all fairly close to the 1min 30sec mark. This is valuable information as I know in the past my paying customers have generally been in that second age group with more established businesses and careers. However, with consistent younger traffic, that trend could be shifting in the near future. Similarly to Age, you can categorize by day, week or month views on the Demographics > Gender tab. I suggest toggling back and forth between week and day to see what is popping up for you. For my content if you look at week views I am getting about 30% male traffic, but if you back off to days it really is only popping up on certain days. Also the bounce rate for males is 7% on average higher than female, which in general would mean that most men find what they are looking for and get in and get out. In the week view you can see a fairly consistent male traffic. On the day view you notice it is actually certain days more than others that peak male interest. You could take information like this and compare to your blog content posting. If certain articles are resonating more with your ideal audience you might try to contrast that information with these charts to figure out what type of content is working better for you. You can even get really awesome location data inside Google Analytics. Pinpoint exactly where your traffic is coming from. You will notice 75% of my traffic is from the United States. If you zoom into the states you see that Think Creative has been read in 45 states across the U.S. I suggest sorting by average session duration on both the state and city views to see who is sticking around longer. In general my content is relatable to anyone in English speaking countries. However, I do put an emphasis on my community/city 20% of the time, which is why Kansas and Missouri have much higher traffic amounts. See where in the world people are visiting your website from. If your content is more relevant to people in certain areas you may notice hot spots on your maps. In the Geo > Location tab you can break down by acquisition, behavior or conversions. My blog is still relatively new as far as blogs go so the fact that 67% of my visitors are new isn’t shocking. However, the 33% that do return spend an average of more than 3 times as long on the site. You always want to increase your returning visitor number as well as session duration and page views. My returning visitors also have lower bounce rates which mean they spend more time on your site and visit more pages before they decide to leave. In this view, you can see where your traffic is coming into your site from. At a glance you can see that direct traffic is the highest category with 45%. This is really interesting because most of my direct traffic can be inferred to be from Instagram. That being said with recent changes made in Facebook’s algorithms and new strategies I have been trying with Pinterest, I think my Pinterest traffic could potentially overtake my direct traffic in the next couple of months. Next week, I will be doing a piece on Pinterest Marketing and some game changing simple tweaks I made. I hope this gives you a taste of how to use Google Analytics to find your current “real” audience. If you have questions about how I got this information or have other specific questions feel free to ask below in the comment section.